Is Agile Just a Hype? | Leanify Ltd.
You are here: Leanify Ltd. > Blog > Agile > Is Agile Just a Hype? There is a lot of talking about Agile especially in the IT industry, and I hear many people saying: it’s the currently fashionable way to approach software development and it will eventually pass. Let me share some of my thoughts on why I don’t think Agile is just a hype. First of all, let’s look at the concept itself. When we first started talking about Agile, most of us would relate it primarily to a few frameworks and methodologies, such as XP, or Scrum. “Being Agile” meant applying (or trying to apply) some of these in your projects. Over the past 10 years, however, the meaning of the word has been growing enormously – and I believe it will continue to grow, because of the evolving practices, experience, and our understanding as a community of what it really means. So now, in addition to those methodologies, we have a much broader spectrum of topics and questions that we are trying to address when we talk about Agile. For instance, we have the concept of Agile software engineering, which contains a bunch of techniques and ideas about writing code that can better meet the requirements of the business dynamics – scalability, flexibility and quality at the same time. On the other end of the spectrum of topics, we are talking about modern leadership, which involves communication, based on respect and collaborative learning. Somewhere in between there is still space for project and process management frameworks, and they are also evolving to meet the needs of the teams – from Scrum to Kanban, Scrumban, DevOps, etc. So, in essence the concept of Agile has grown from a plain collateral term for a bunch of methodologies to a broad notion that attempts to capture the idea of flexibility on all levels of how we do business – from strategy through operations and HR management to sales and customer engagement. Being a big picture thinker, I have to climb up the ladder and look at all of this from an even broader, global perspective. Just think how fast the world has been changing in the past 5-7 years! We’ve been witnessing technological inventions happening every couple of months, and we’ve also seen financial, political, and demographic crises that have put forward a number of challenges to our societies. The internet has broadened immensely business opportunities and capabilities, and social media has become a major source of information and opinion driver. In this dynamic environment, organizations are being faced with new responsibilities. They are no longer relatively autonomous players – awareness about the impact on the overall system is growing, and organizations pay more attention to the so-called “triple bottom-line” (planet, people, and profit). The growing focus on the importance of individuals can be seen in a variety of trends – starting from the increased focus on user-centricity in building products and services, up to people being recognized as the core value of organizations. So, taking it from this perspective, all of this poses a need for a change in the way organizations function, and in what they value, and this change needs to be on all levels and layers – from their structure to the organizational culture, and the way each individual in the company contributes to its value added. It is through a smarter utilization of the individual potential that companies can make the quantum leap they need to make so that they are competitive and can thrive in a world of constant change. This is where the broader concept of Agile comes into play. 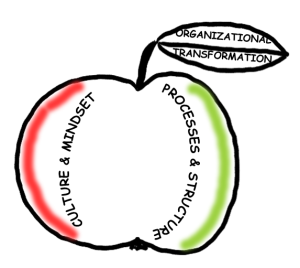 Those companies, which have become aware of these trends, are already changing themselves – some of them taking as a starting point the organizational structures and processes – normally, by adopting Lean or Agile practices; others starting from a leadership and mindset transformation by applying a coaching approach and later realizing the need of changed structures and processes as well. There are already good examples and success stories for companies that have improved their bottom line results as a result of such transformation due to better performance, higher employee engagement, more customer focus, and higher efficiency of operations. And a lot of other companies are going along the same path, which makes me think that Agile will be around for much longer, not just as methodology theory, but as a practice of certain values and mindsets. Show respect to every one of your colleagues – even if you disagree with their opinions, acknowledge the fact that they have one, and try to find the value in what they are saying or doing. Ask questions – next time you are in a discussion with a colleague, ask open-ended questions (such as “What do you mean?” or “Tell me more”) to understand fully his or her ideas before you assess them and make a decision. This might even help you evolve your own ideas. Give open feedback – state openly what you like or dislike about a situation and engage in a conversation with your colleagues on how they can improve. But do it respectfully – very often people lack the skills, not the desire to do something well. Consider trying some of the Agile techniques or frameworks in your project – discuss with your manager and an Agile coach or practitioner what might be a good way to start. Experiment and see what works well for you and your team! And finally, we welcome you to share your thoughts and experiences too. ← Why Is the ScrumMaster’s Role so Important?